Bank of America, the fifth-largest corporation in the world in 2004, has its roots in the 1957 merger of two Charlotte institutions, the American Trust Company and the Commercial National Bank. The newly formed American Commercial Bank, under the leadership of Addison Reese, merged three years later with Security National Bank of Greensboro. The new entity, North Carolina National Bank (NCNB), had assets of about $500 million. After an aggressive acquisition of a bank with the same name that was headquartered in Jacksonville, N.C., NCNB, with 40 branch offices in 20 North Carolina communities, was the second-largest bank in the state behind Wachovia Bank of Winston-Salem. In a three-way contest with Wachovia and First Union Bank Corporation, NCNB began an aggressive policy of constructing new branch offices, merging with other banks, and expanding its assets. Reese was first in the state to enroll his bank in the new national BankAmericard program. The bank credit card gave customers a more efficient way of managing their money and enabled the bank to earn a transaction fee and attract new customers. By 1973 NCNB had surpassed Wachovia as the largest bank in the state. NCNB often led the way in social and community causes, helping, for example, in the redevelopment of downtown Charlotte, putting branches in poor areas of the city and aggressively hiring African Americans and women. After Tom Storrs became its CEO in 1974, NCNB expanded its international commitment by opening branches in England, South Africa, Australia, and Hong Kong. By 1976, with the Charlotte giant controlling 20 percent of the state's retail banking market, NCNB moved into interstate banking. Through ownership of the Trust Company of Florida, NCNB purchased the First National Bank of Lake City and quickly established a presence throughout Florida. In 1983 Hugh L. McColl Jr. became CEO of NCNB, succeeding Storrs. The son and grandson of bankers, McColl immediately consolidated acquisitions in Florida while moving into Georgia, South Carolina, Maryland, and Virginia. By 1987 NCNB was the largest bank in the Southeast. The 1989 acquisition of First Republic Bank, the largest bank in Texas, made NCNB the nation's ninth-largest bank. In 1992 NCNB merged with Atlanta-based C&S and Sovran, the country's twelfth-largest bank, to become NationsBank, with nearly 2,000 offices and more than 59,000 employees. Through the $1.38 billion purchase of MNC Financial Corp. in 1993, merger with Boatman's Bankshares of St. Louis in 1996, and the purchase of Florida-based Barnett Banks in 1997, NationsBank became the third-largest banking entity in America. McColl completed the process of transforming a regional bank into the first nationwide bank in 1998, when NationsBank merged with BankAmerica Corporation, which was based in California, to form the new Bank of America, then the largest banking institution in the nation. When McColl's tenure began, NCNB operated in two states, employed 7,600 people, and had assets of $12 billion. By 2006 the Bank of America Corporation, which remained headquartered in Charlotte, employed more than 175,000 people, managed total assets in excess of $475 billion, had operations in 29 states and the District of Columbia, and provided financial services to clients in 150 countries worldwide. Howard E. Covington Jr. and Marion A. Ellis, The Story of NationsBank (1993). John Monk, "The Billion Dollar Man," Carolina Lifestyle (September 1983). Howard Troxler, "The Tortoise and the Hare," Tar Heel (June 1982). "Bank of America Corporation." Encyclopædia Britannica Online. 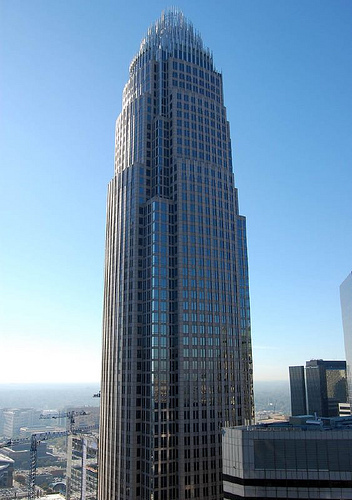 http://www.britannica.com/EBchecked/topic/51984/Bank-of-America-Corporation (accessed November 26, 2012). "Nationsbank Records, 1962-1997, Collection no. 04780." The Southern Historical Collection, Louis Round Wilson Special Collections Library, University of North Carolina at Chapel Hill. http://www.lib.unc.edu/mss/inv/n/Nationsbank.html (accessed November 26, 2012). Covington, Jr. Howard E. and Ellis, Marion A. The Story of NationsBank: Changing the Face of American Banking. Chapel Hill: University of North Carolina Press. 2001. http://books.google.com/books?id=1Nyuak3CMQwC&printsec=frontcover#v=onepage&q&f=false (accessed November 26, 2012). Johnston, Moira. Roller coaster: the Bank of America and the future of American banking. New York: Ticknor & Fields. 1990. "Bank of America Corporate Center, Charlotte." October 16, 2008 in Charlotte, NC, by Flickr user James Willamore/Willamore Media. http://www.flickr.com/photos/bz3rk/2946926115/ (accessed November 26, 2012).